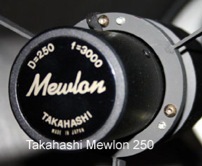 The knobs below will fit all versions of the Takahashi Mewlon 180, 210, and 300 mm aperture Dall-Kirkham secondary. 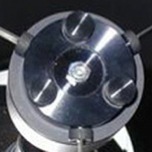 We do not offer knobs for the Mewlon 250 because of the factory collimation screw geometry. Select knobs for your telescope from the list below. The factory dust cover will fit normally with the knobs in place. Knobs include a set of long spacers so they clear the secondary housing lip. 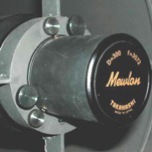 We don't offer knobs for the Mewlon 250 secondary because there isn't enough room around the electric focuser to fit knobs of a useful size. Furthermore, the factory push-pull screws are so close to each other that the replacement knobs would need to be staggered in height, adding to the inconvenience. 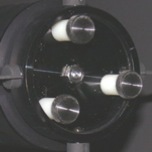 This telescope has a push-pull collimation arrangement that requires a total of six knobs. Clearance is tight around the electric focuser.